In legal documents the old-fashioned outside toilets used to be referred to as ‘necessary houses’. 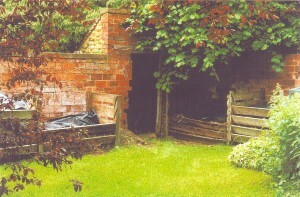 In Warmington some of these are still standing and in use, though not for their original purpose. One such is at Grove Farm. 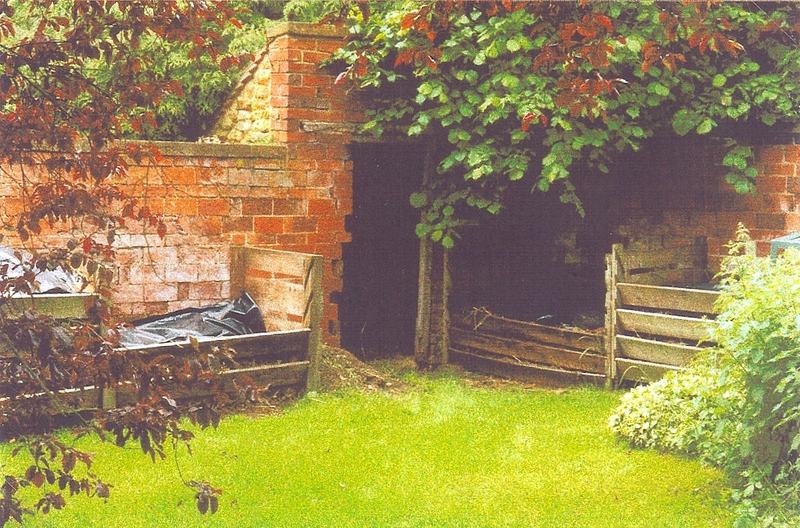 This little redbrick shed near the right-hand garden wall behind the house still sports its original three-seater – two adult and one child size – obviously a family arrangement! Agdon House has a similar red brick structure with a tin roof. It is neatly fitted flush into the property-dividing wall in the right hand bottom corner of the garden, the back jutting out of the wall on the neighbour’s side. Inside the two-seater board is still in place, just as it used to be before the ‘luxury’ of bathrooms and toilets inside dwellings. 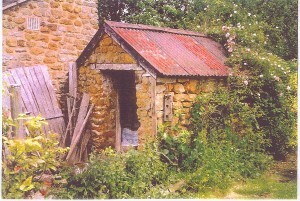 The privy at Bachelor’s Cottage is built of stone, its walls 18 inches thick. The tin roof and wooden door lintel look like they are still the originals. Some of the stone work has been pointed with cement in later years, though it appears that the original walling had no mortar showing on the outside of it at all. 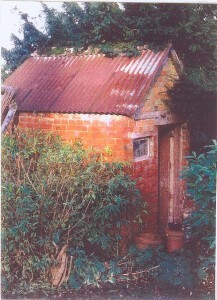 The toilet seat has been removed, the space having been promoted to storage and tool shed. The present owner explained why there was usually some firewood kept close to the privy: Ladies used to feel uncomfortable being seen going to the necessary house, and preferred to disguise the purpose of their trips down the garden by reappearing with a piece of wood for the fire. 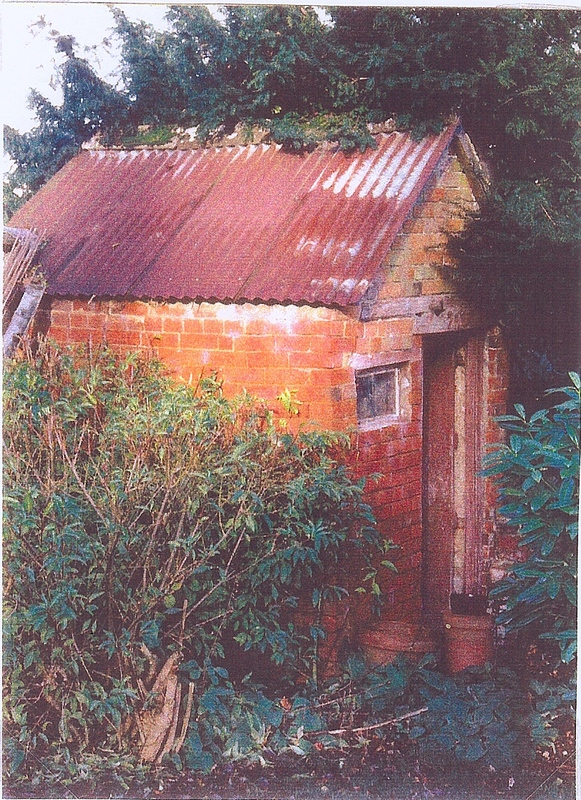 The outside privy of Mistletoe Cottage was demolished when it was bought in 1973. 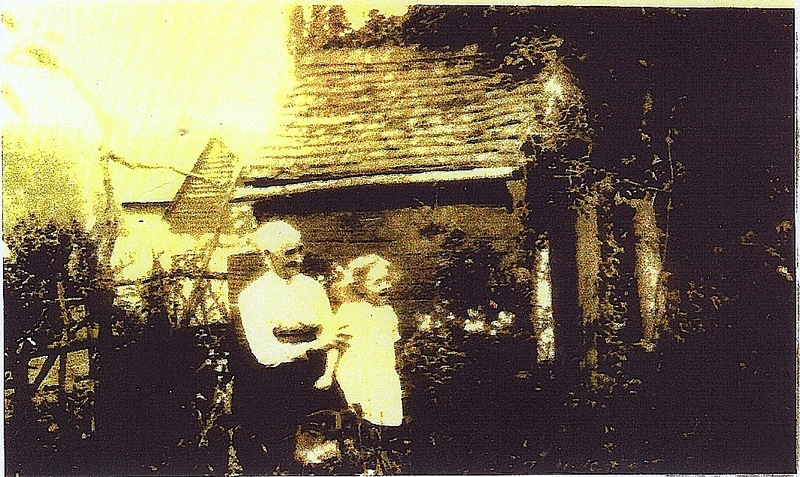 The photo below dates back to 1928 and shows Esther Castle with her granddaughter Ursula Castle. 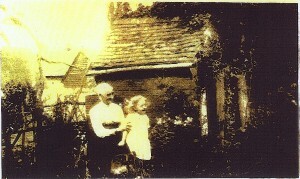 The privy had had a major make-over when Charlie Castle had bought The Cottage (now Mistletoe Cottage) in 1923. Things like a new roof, floor, window and a coat of paint inside had made it as presentable as possible, not to mention the little pictures and texts Edith, his wife, would pin up inside to ponder upon. In those days the closet, as it was called, was emptied regularly once a year. The tool used was a scoop fitted with a very long handle, with which the contents would be ladled out into a barrow and wheeled to the garden or allotment. There it was put into trenches and dug into the soil as fertiliser. It took many trips to complete the task – not a very pleasant or popular one! 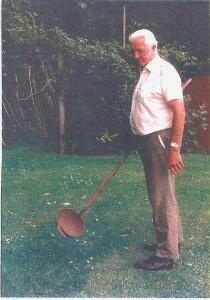 Pictured is Bernard Castle with his father’s closet scoop, used from the 1920s up to the late 40s.